What is HTML 4 tutorial? HTML stands for Hyper Text Markup Language. This is the mostly used language on Web to develop web pages. HTML was developed by Berners-Lee in late 1991 but HTML 4.01 was a major version of HTML and it was published in late 1999. 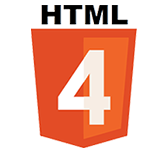 Though HTML 4.01 version is widely used but currently we are having HTML-5 version which is an extension to HTML 4.0. This tutorial is mainly helpful for the Web Designers and Developers who wish to learn the HTML in detail with its practical examples. This tutorial will be useful to go to the next level from beginners to expert level. To learn this tutorial one must have a basic working knowledge of Windows or Linux operating system. Additionally you must be familiar with any text editor like notepad, notepad++, or Edit plus etc and understanding about images in different formats like JPEG, PNG format. Keep It Interesting After It’s Built! Check Your Site, And Then Check It Again!